When you open up 722’s (seven twenty-two) website, the header states “well balanced rock.” A fair statement to this quirky group – and it’s just like they claim: imagine combining theater with a rock band. We’re Taking Over is definitely one of the more stand out albums in rock, not because it’s better or worse, but that it’s extremely different; one like you’ve never heard before. Listening to just the record most likely does not do 722 justice. The magic is in the performance (meaning you gotta seem ’em live to appreciate the full beauty)! Either way, We’re Taking Over is experimental rock at its finest, or maybe I’m just a sucker for female leads in rock bands. But don’t run away because the music isn’t one to be heard on the O.C., it’s actually pretty catchy. It isn’t necessarily something where you’d be singing along, but it’s not a headache to listen to either. If you had to compare, 722 can be described as a really early No Doubt, like still in the process of finding their signature sound. 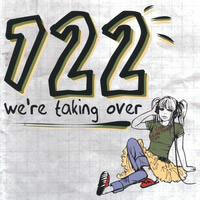 However, this is 722 and not ND and they have found their sound and they make it fun for you. I mean, this is their sophomore album! Simple and to the point. “I Quit” is layered quite nicely, actually. It has the rock guitar solo, gentle melody and of course the outstanding three-part harmonies. If you’re looking for a track that you can sing along with, try “Can’t Stand.” That can be in line for an indie hit for sure. I don’t like that description word of “experimental” when categorizing some rock music. It’s one that tends to steer people in the other direction because they’re afraid, because the music doesn’t conform to today’s hit standards. However, given the chance, 722 are actually pretty damn good at what they do. Soft female vocals on top of rock music harmonizing with a male counterpart? How much better does it have to get? For a band that doesn’t have an exact format to fit in, a direct blunt comment about their record is sufficient. It’s really good… And you should scope it out.